FORMULA designates a CASAPPA gear pump range specifically designed for applications requiring high pressure levels even at low speed; applications such as truck-mounted cranes, tripper trucks and lift-trucks etc. Special design features and an exclusive CASAPPA patent have perfected a sophisticated mechanism which makes FORMULA a highly reliable unit, proven by years of service in the specific field of use. The versatility offered by the range of Italian (triangular) European (ISO) and American (SAE) mounting flanges allows to the FORMULA pumps to be used in several applications. 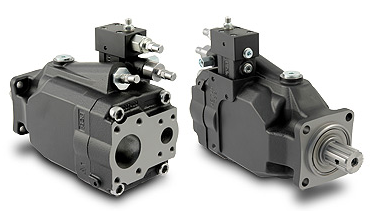 "SFP" is the new line of hydraulic gear pumps of the Formula series is available in groups 3 and 3,5. The main features of new Formula "SFP" line are the noise level reduction, the availability of different ports position and the modular and compact design for direct mounting on PTOs. Variable displacement axial piston pump, swash plate design, ideally suited for open circuit truck applications. The compact design allows the pump to be directly mounted on PTO's.